SCH80 Pipe, ASTM Sch80 Standard, ASTM Sch80, ASTM CPVC Manufacturers and Suppliers. Find SCH80 Pipe, ASTM Sch80 Standard, ASTM Sch80 on Industry Directory, Reliable Manufacturer/Supplier/Factory from China. Product categories of ASTM SCH80 CPVC, we are specialized manufacturers from China, SCH80 Pipe, ASTM Sch80 Standard suppliers/factory, wholesale high-quality products of ASTM Sch80 R & D and manufacturing, we have the perfect after-sales service and technical support. Look forward to your cooperation! 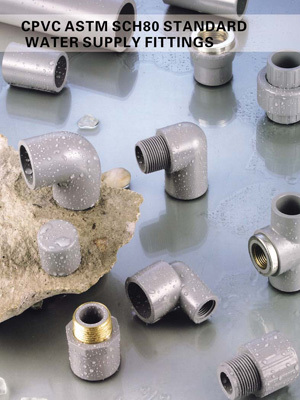 JESSRO CPVC pipe and CPVC fittings of ASTM schedule 80 standard system which have excellent heat resistance and high impact can be used to covey cold and hot water with or without pressure. Our CPVC pipe and CPVC fittings of ASTM schedule 80 standard are widely used in housing , hotel, springs, kitchen bate and solar water heater water transpiring systems with no rusting and long life time. We have all the size from 1/2" to 4" in a full range items. 5)Widely used to agriculture, irrigation and industrail usage, swimming pool ect. All of our CPVC pipe and CPVC fittings of ASTM schedule 80 standard can following your specific requirement .And we can supply you the professional service. Looking forward to the pleasure of receiving your detail inquiry!